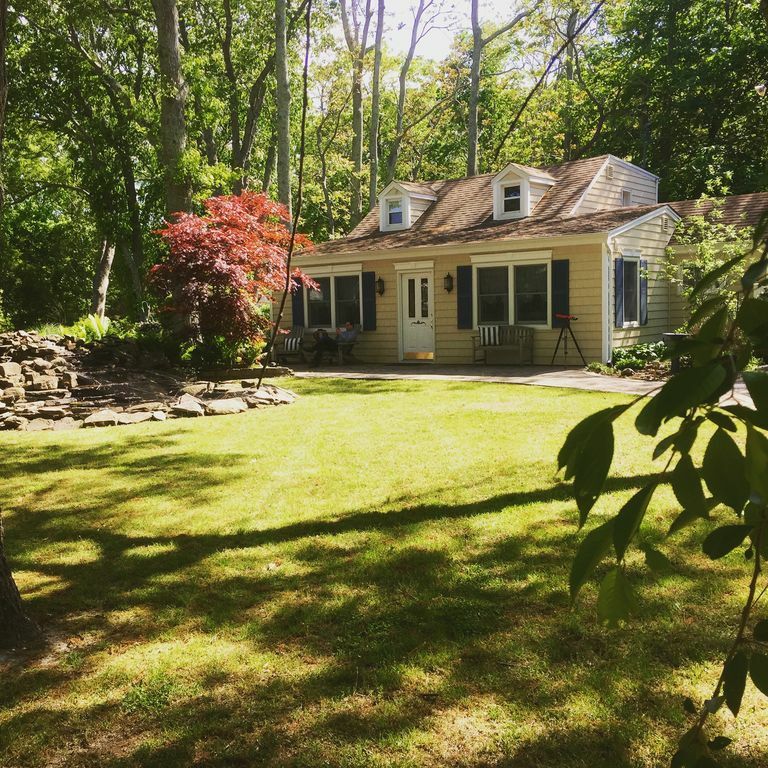 Four bedroom/2 bathroom cozy cottage located in the heart of the North Fork. Offers 3 bedrooms and 1 bath in main house with separate guest quarters including guest room loft and private bath. Includes outdoor shower, firepit, large bbq with fridge and outdoor dining with fireplace area. Centrally located within walking distance to private Peconic Bay beach, Magic fountain ice cream shop, CVS, and a mini shopping mall with supermarket. Minutes away from Laurel Lake Vineyards and many more wineries and farm stands. A perfect getaway at an affordable price offering many amenities and walking distance to a lovely private bay beach. This house will include many unique benefits such as a separate guest suite including a separate bath and sleeping loft(up to 3 people), an outdoor fireplace, an outdoor fire pit, an outdoor shower with changing room, a huge gated driveway which will conveniently allow for multiple cars and for kids to play with the provided electric go-karts, bicycles, green machine, and more....Walking distance to the private bay beach(alcohol permitted-please be responsible) and walking distance to the famous Magic Fountain Ice Cream Parlor, CVS, Starbucks, the mini mall, the Mattituck Cinema, and supermarket. Offers a private outdoor shower as well. Indoor gas fireplace and wood outdoor fireplace along with outdoor fire pit. Standard Coffee Maker and Keurig Machine. Fully stocked kitchen with butcher block. Indoor Dining Area seats 6... Outdoor Dining Area seats 8..
Includes (1) Two Seater Tandem Bicycle, (3) other adult bicycles, and (1) child's bicycle. Also includes (2) Electric bikes! $ 195 Cleaning Fee for all stays. 3rd time is a charm for us ! Amazing stay at a perfect home! This was the perfect getaway home for our family! The home is very comfortable and very well appointed. The kitchen is well-stocked with everything you might need. The guest suite was beautiful and private. The yard was perfect for enjoying our family’s favorite pastime of badminton. The fireplace and fire pit were great for the cool evenings. The woods behind the home provide a peaceful and quiet setting, but yet, you are nearby to everything on the North Fork. The great amenities in the garage were a bonus...the scooters and bicycles were used a lot. Thank you, Sharon and Alex for an enjoyable stay and we look forward to coming back next summer. A beautifully decorated, comfortable home with lots of room and a great outdoor space. A walkable distance from the beach. Close to all of the great places to visit in NoFo. We thoroughly enjoyed another great stay at "North Fork Cottage Getaway". The lovely house/apt, beautiful grounds and perfect location completely satisfies our "3Cs" of hospitality: Comfort, Cleanliness, and Convenience!! An extraordinary overall experience that we would highly recommend. Thank you Alex! Great location, walking distance to the beach, stores, and restaurant. Very nice house and fully stocked. We will definitely rent this house again and highly recommend it. Alex was very helpful and gave us several great recommendations. Keys for the main house, guest house, and garage will be found at a predetermined location. Having fun is required!